Home / Pet Grief / Do Pets Experience Grief? Grief is a natural process that humans deal with over the course of life. But they aren't the only ones who feel it. 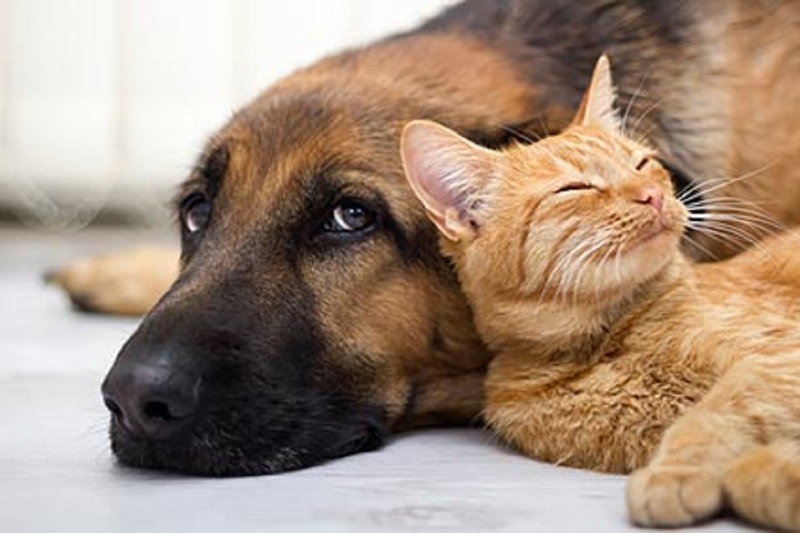 While we can't read animals' minds, we know that they display behaviors and mannerisms consistent with the emotions surrounding this apparently universal feeling. Elephants and primates have been known to vocalize their sorrow or to show an astonishingly acute understanding that the deceased is dead or at least gone and will not return. For example, elephants have been observed to hold vigil over stillborn baby elephants, or to caress the corpses or bones of their dead. Sometimes they will even hide the bones under leaves and other growth - although why they do is unknown. Another example is of a group of chimpanzees in a Cameroon, West Africa. Over a dozen chimps at the Sanaga-Yong Rescue Center gathered one day, standing together with arms around one another's shoulders as one of their own was brought by - Dorothy, who had passed on due to heart failure. House cats too have displayed this, though in their case, if they are able to see the deceased (whether a fellow pet or human companion) they seem to understand that the other person/pet is gone. This may be because they are predators and link the different scents and non-mobility with not being 'alive'. We don't know if dogs are capable of making the same connection, but it is a certainty that they feel 'something'. So, What About Dogs – Can They Grief? As with humans, dogs come in all shapes and sizes with as many personality variations as there are dogs. Also as with humans, where grief is subjective, so too is it with dogs. For some, it may simply be an adjustment in the order of the pack. If the lost companion or animal was an integral part of the dog's life, the social chain will need to be reformed, assuming it can be. Other dogs may go through separation anxiety, sitting by the window or door (sometimes for days on end), waiting for the absent companion to return home. Accompanying this is the change in the physical makeup of the home. Certain familiar scents will begin to fade, and any routine that the missing companion provided will, of course, be lacking. According to Marc Bekoff, a professor emeritus of ecology and evolutionary biology at the University of Colorado at Boulder and the author of Canine Confidential: Why Dogs Do What They Do. Some dogs will decline food, may become despondent or go the other way and become irritable. Or they may go to a place they feel safe and hideaway. You should give your dog time to do his or her thing, but keep a close eye on him or her. Sometimes, symptoms of grief can manifest as signs of some physical ailment, so make sure your dog isn't genuinely sick before traversing other avenues. You don't necessarily need an animal behaviorist to help your dog get over his or her sadness. Engage with the dog, go on long walks, talk to your dog, pet him/her, and reinforce the bond you have with him/her so that the focus will be less on the missing person.